Non-medicinal ingredients: Sucrose, glucose syrup, caramel. Dissolve one lozenge slowly in the mouth every 1 – 2 hours up to a maximum of 4 lozenges per day. If symptoms are severe or persist for more than 2 days or accompanied by high fever, consult a doctor. Consult a health care practitioner prior to use if you have anaemia. Consult a health care practitioner prior to use if you have gallstones, hiatus hernia or gastroesophageal reflux. Some people may experience gastroesophageal reflux. Contraindications: Do not use during pregnancy or breast feeding. Do not purchase if package is open. 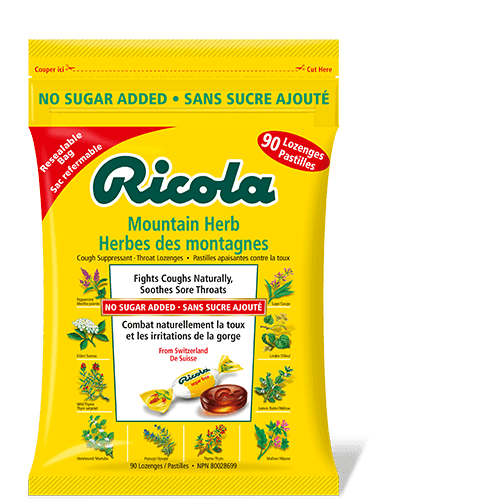 Non-medicinal ingredients: Isomalt, caramel, sorbitol, aspartame. 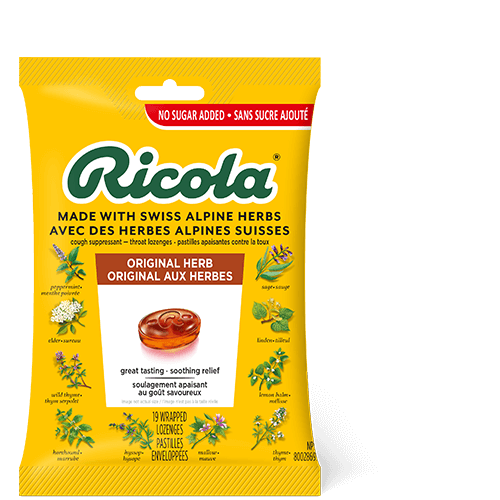 Recommend use or purpose: For the temporary relief of coughs and sore throat. Recommended dose: (Adults over 12 years of age): Dissolve one lozenge slowly in the mouth every 1 – 2 hours up to a maximum of 4 lozenges per day. If symptoms are severe or persist for more than 2 days or are accompanied by high fever consult a doctor. 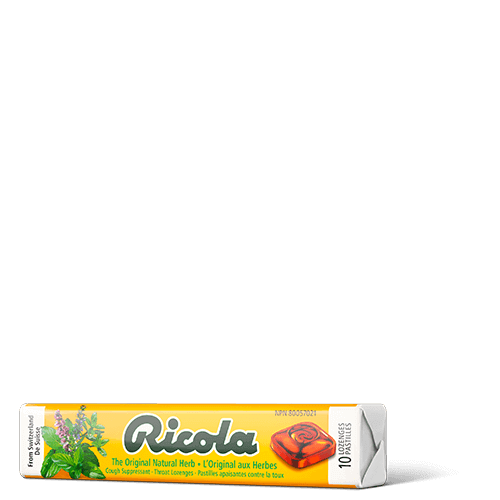 Medicinal ingredients per lozenge: Menthol 3.74 mg, Peppermint essential oil 3.12 mg, Extract of Ricola’s herb mixture 27.74 mg: peppermint herb (mentha x piperita) 6.93 mg [1.33:1, QCE 9.22 mg], lemon balm (melissa officinalis) 6.93 mg [1.33:1, QCE 9.22 mg], thyme herb top (thymus vulgaris) 4.16 mg [1.33:1, QCE 5.53 mg], sage herb top (salvia officinalis) aerials 3.75 mg [1.33:1, QCE 4.99 mg], hyssop herb top (hyssopus officinalis) 3.75 mg [1.33:1, QCE 4.99 mg], black elder flowers (sambucus nigra) 0.69 mg [1.33:1, QCE 0.92 mg], linden flowers (tilia cordata) 0.69 mg [1.33:1, QCE 0.92 mg], wild thyme herb top (thymus serpyllum) 0.28 mg [1.33:1, QCE 0.37 mg], horehound herb top(marrubium vulgare) 0.28 mg [1.33:1, QCE 0.37 mg], high mallow leaves (malva silvestris) 0.28 mg [1.33:1, QCE 0.37 mg]. Recommended dose (Adults and children over 12 years of age): Dissolve one lozenge slowly in the mouth every 1 – 2 hours up to a maximum of 10 lozenges per day. 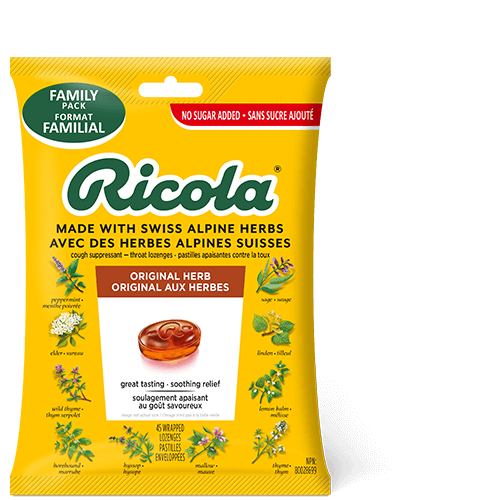 For nearly a century, Ricola has been helping throats feel better naturally. 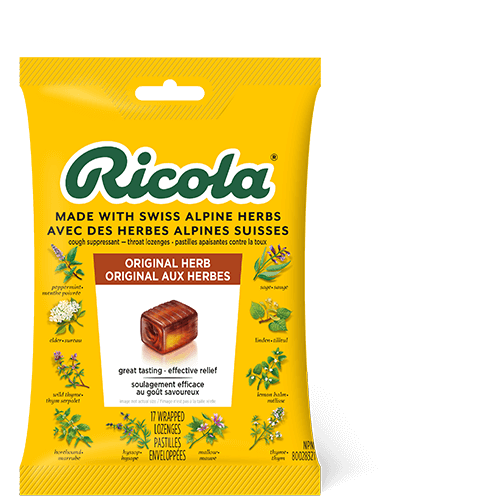 Using only high-quality herbs grown high in the Swiss mountains to make our world famous herb cough drop. Along with its pleasing herbal taste and unique square shape, it provides you soothing relief from coughs due to colds or flus. And today, it can also help with itchy throats from allergies. Or with daily voice care for dry and hoarse throats.